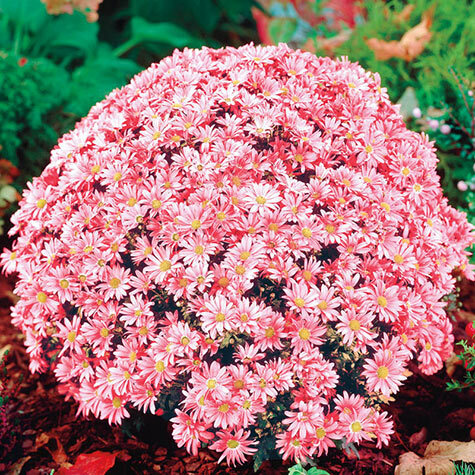 Coral Daisy Monster Mum | Gurney's Seed & Nursery Co.
Coral-pink blooms cover the mounded plants. A true perennial that can withstand temperatures to -30°F ! Years of breeding result in plants 3-3 1/2' tall and up to 5' wide that form a perfect cushion shape, and bear hundreds of brightly coral-pink colored flowers that butterflies just love. Plant individually or as a hedge, and they'll brighten your garden in late summer and fall, when other plants are done. Easy and carefree – no pinching or deadheading required! 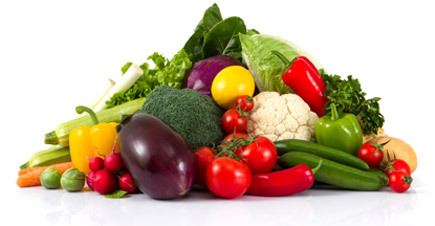 Space 18-24" apart in average, well-drained soil. Zones 3-9. Ships in 3" Pot. Chrysanthemum morifolium. Full Sun to Partial Shade. Deer tend to avoid. Color: Coral pink with yellow pincushion centers. Blooms: Late summer thru fall. Flower Form: Daisy type, 3 - 4" across. 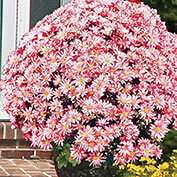 Comments: Low maintenance, vigorous, winter hardy mums are just a few of the outstanding characteristics of these larger than life mums. 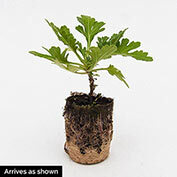 During the first growing season, their size will be comparable to regular garden mums, but the next growing season they will double in size due to their abundant rhizome production that serve to overwinter carbohydrates and gives rise to many more stems the following spring and helps to produce a large dense plant. No pinching is required for these mums to look thick and full of blooms when the late summer season demands color.